What’s The Coolest Car You Saw At The Austin Grand Prix? At every F1 race, car enthusiasts come out of the woodwork to show off their coolest rides. You end up with all kinds of parking lot car shows and highway parades all weekend long. Nothing was different at this weekend's inaugural U.S. Grand Prix at Austin. 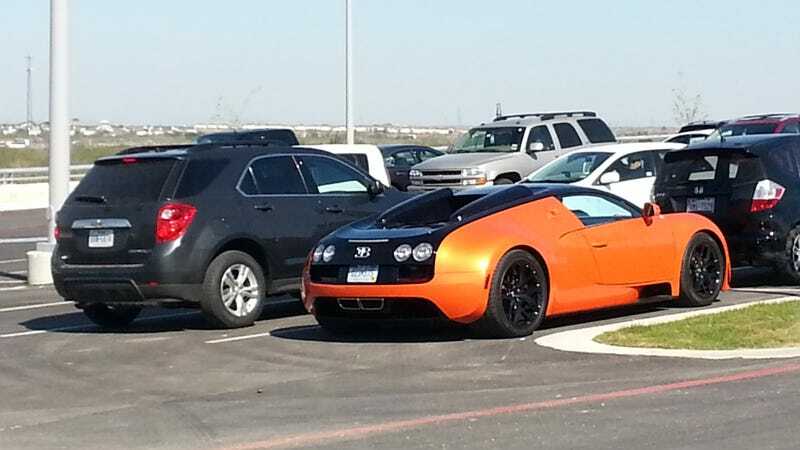 Our own reader iceman, the man who follows a trillion people on twitter, spotted this Bugatti Veyron in the Circuit of the Americas parking lot. Makes the Chevy next to it look a little pedestrian, no? So go ahead and post the coolest cars you saw at Austin, we're sure you can top a lousy Bugatti no problem.